Like many museums, here at the Monterey County Agricultural & Rural Life Museum, we operate on a small staff. With just 2 taking care of all that the museum needs on a daily basis, that means being open to taking on new, sometimes foreign jobs. Administrator is event coordinator is programmer is marketing is . . . ok, so you get the point. 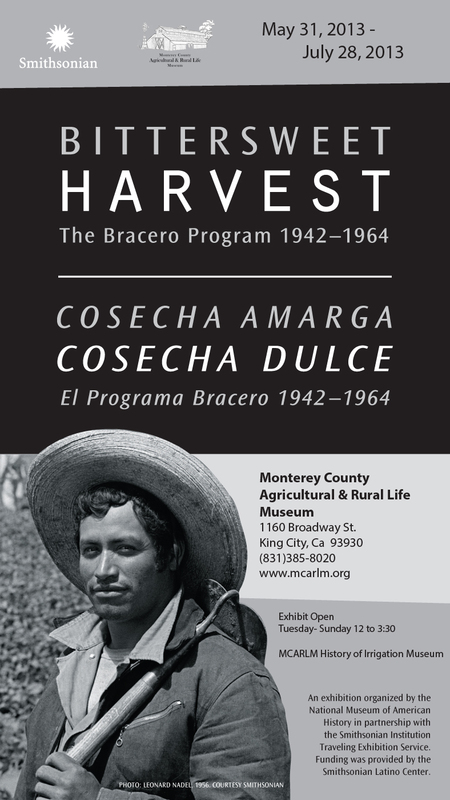 We are very excited about hosting the exhibition, Bittersweet Harvest The Bracero Program 1942-1964 this summer. This exhibit on loan from the Smithsonian will include programming focused around it and we are preparing to do a lot of promotion for it. Luckily, the Smithsonian provides a graphics package for all of our promotional needs! Unfortunately, it is all Mac based, and here at our humble museum, we are happy to fumble around our pc. Time to bring out the graphic design hat and learn how to use that Adobe Photoshop program that has been hidden neglected in the All Programs file. Days of cutting and pasting, playing with an eyedropper and paint bucket and I have a folder full of beautiful promotional items that even the Smithsonian approves of and says “send them to print!”. So after diligently price comparing multiple sources, I find both quality and a price that fits my budget. Download this and that, and we are off to print! Take a moment to bask in the pride of overcoming a challenge and then a quick change of hats and on to the next task. All is good in the land of graphic design, until I receive an email notifying me that my order is all wrong. It must be print ready and needs to bleed? A couple more hours delving into the foreign language of graphic design, and we are back on track. Files are back at the printer, confidence is renewed and graphic design hat is safely stowed away and replaced with a more familiar and comfortable hat. Working in a small museum with a small staff certainly has it challenges, but the reward is learning and growing with the immediate need and being able to adapt to almost any situation.